An Asos Haul was inevitable when they were offering 20% off for students. I tried to restrain myself but having already caved on my spending ban I thought the damage had already been done, plus with 20% off everything on the site I saw it as an opportunity to pick up a few items on my wishlist as well as pick up old favourites. NARS Creamy Concealer in Chantilly / I have been lusting over this for so long and I blame Em Ford over at My Pale Skin for this as she demonstrates how great it works as a concealer and I was sold. With 20% off, instead of the RRP of £22, I got this £4 cheaper and although that still makes it the most expensive concealer in my collection, I have high hopes. Chantilly is the palest shade but promises not only to conceal blemishes but also to highlight the face. Do leave a comment if you’d be interested in a post about all of the concealers in my collection and how I find they compare! 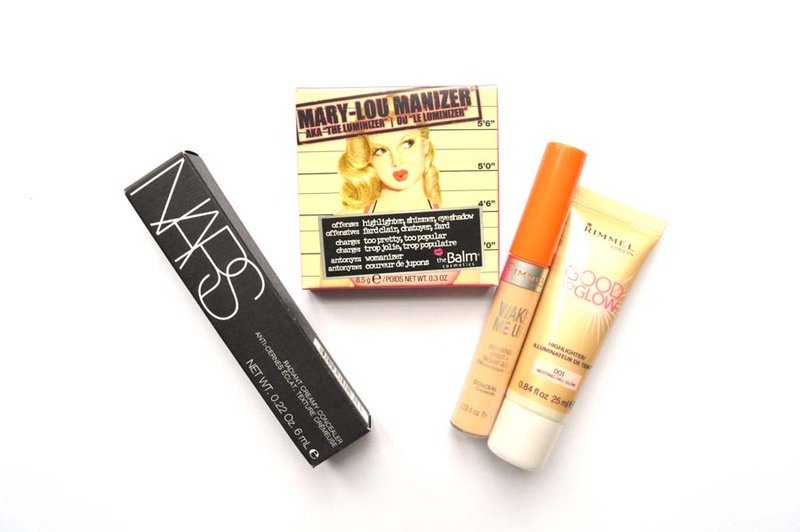 The Balm Cosmetics Mary-Lou Manizer Highlight / Again another item I have lusted over for quite some time. I have a couple of highlighters already in my makeup stash but none that offered the champagne look this does. I swatched this in a store so long ago and ever since kept my eye out for it. It works so well with my skin tone and gives such a ‘glow from within’ finish, I’m elated that I finally own it! Rimmel’s Wake Me Up Concealer in Ivory / This is an old favourite of mine and I had to stock up with the discount available.This ended up costing a whole £3.50 and is a great concealer for covering dark circles and brightening them acting as a very soft highlight. The NARS concealer is going to be a little more heavier than this and I like having the option of a light and a full coverage depending on how my face is feeling on a particular day. This lasted me for so long before and very happy I have another one! Rimmel’s Good To Glow in Notting Hill Glow / Can you see a bit of a theme here? This spring is going to be all about the glow and this cream highlighter is the first of the kind in my collection but seeming as I’ve been loving using makeup sponges to apply my makeup the two together are really going to pair up to make an amazing glow that will also look super natural. Plus it being called ‘Notting hill Glow’ only attracted me more as Notting Hill was the first film Rich and I watched together almost three years ago now and so I get weak at anything that reminds me of that. As you can see I’m a total sucker for a bargain and having not even lasted a month on my spending ban the ASOS student spree was totally inevitable. I love the range of product ASOS has of beauty items and nowhere else are you able to get NARS products at such a discount. Would you like any full reviews of the products above? Let me know! Mini Mac Haul #2 / A Massive Lush Christmas Haul / Dupe Haul with Makeup Revolution. Previous Post What I Learnt During My Dissertation. Next Post What Exactly is a Dermaroller?